NEW YORK (CNNMoney.com) -- Gold prices continued to push higher Tuesday, reaching another record high, amid ongoing concerns about the economy. Gold futures for December delivery rose $9.70 to settle at $1,308.30 an ounce, topping Monday's all-time closing high of $1,298.60 an ounce. The metal has hit a series of record highs in recent weeks, including a new all-time trading high of $1,311 an ounce earlier Tuesday. 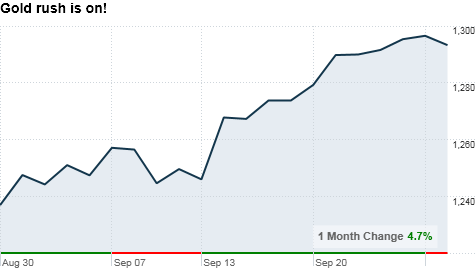 Gold is up 4.7% over the last month, and has gained more than 30% so far this year. "The gold market is really starting to explode to the upside," said Adam Klopfenstein, said senior market strategist at commodities brokerage firm Lind-Waldock. "This is indicative of a market that's going to continue to move higher." In the near term, Klopfenstein said he believes gold prices could rise as high as $1,332 an ounce before "running into some congestion." Gold prices have been supported by a recent spate of mixed economic reports, which have fueled speculation that the U.S. economy will continue grow at a sluggish pace for some time. In addition, the dollar has been losing ground in the currency markets, which typically lifts the price of commodities that are priced in the U.S. currency, such as gold. In afternoon trading, the dollar was down over 1% versus the euro to $1.3592. The greenback has tumbled over 6% versus the shared currency over the last month. The dollar has been under pressure amid growing speculation that the Federal Reserve will resume buying U.S. Treasury bonds and notes to help keep long-term interest rates low and support the economy. While many investors would welcome such a move, there is concern that the dollar could suffer as a result of more so-called quantitative easing by the U.S. central bank. "It's this weak dollar policy that's going to continue to fuel interest in gold," said Klopfenstein. Tuesday's advance came after a key index of consumer confidence fell to a 7-month low, stoking fears that weak consumption will continue to be a drag on the nation's economic recovery. The Consumer Confidence Index fell to 48.5 in September, down from August's revised level of 53.2, according to the Conference Board, a New York-based research group. Many investors view gold and other "hard" assets as a way to preserve capital in times of economic uncertainty. Unlike stocks or other financial assets, the metal is less likely to lose all of its value. As a result, prices often rise when signs indicate that economic conditions are deteriorating. '"The gold market is moving higher because people want to own a tangible commodity," said Klopfenstein.